Q. Can I use my tablet computer to read library e-books? How do I find library e-books? 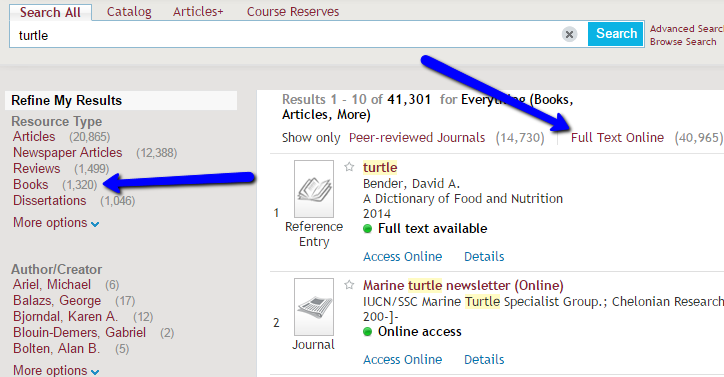 Search the library’s catalog by going to the library’s homepage, library.du.edu, and searching for a book title or topic in the Compass search box. You can then view all of the results of your search that are digital by clicking “Books” as the Resource Type on the left-hand side of the screen, and the "Full Text Online" option at the top of the search results. Note that many physical titles in the DU Library are also available as e-books. The electronic version of a book will be listed separately in the library catalog. Be sure to look for the term “[electronic resource]” after the book’s title in your search results. Other ways to find e-books through the library are described in our E-Book Research Guide. How do I download and print? The e-book world is complex, with many different tablets and readers (including NOOK, iPad, Kindle Fire, and Kobo) as well as many different e-book providers. The DU librarians have created an E-book Research Guide to help you download and print from our different e-book providers using your tablet computer or reader. This is a fast changing world so please let us know if you have any questions or updates for our Research Guide (research@du.libanswers.com or 303-871-2905).